A bit of adventure on the way, we arrived in London at Heathrow early in the afternoon and our flight to Ibiza departed from Stansted at 7:45. Plenty of time right? Not when British coach transport is involved. We bought our tickets and waited for over an hour. The person in the ticket office could actually SEE us waiting. Mike eventually went in to check on our bus which hadn't arrived. They told him it was coming. Then a bus driver on a different bus told us that there was an overturned lorry on the M11 that morning and traffic was backed up about 3 hours. Now certainly the people at National Express knew that but they said nary a word. Nice. The bus never did come, then they put us on another bus and sent us to the central station to get a bus to Stansted there. That also took time. Which we were running out of. There were about 7 of us trying to get to Stansted. Finally they got a bus to take us from Central to Stansted. Which broke down on the M25. We were quietly sitting on the bus waiting for a mechanic when we were boarded by traffic police who ushered us off the bus and set up protective cordons of cones and slant parked their police van to protect us. Apparently the M25 is the most dangerous highway in the world. They were quite serious about protecting us. Finally a mechanic showed up and then the bus that was originally supposed to pick us up at Heathrow. The police escorted us and helped carry luggage to the new bus. That bus we were told, would make no stops and go directly to Stansted. Other people had already missed their flights. Mike and I could still make it. The bus stopped in some tiny little college town to pick someone up who wasn't even GOING to Stansted. They never, at any time, expressed any urgency or concern that we get to the airport or even asked what time our flights were. The unnecessary diversion took about 20 minutes. Mike and I missed our check-in by 20 minutes costing us 75 pounds each to change our tickets to next morning and 100 pounds for a night at the Hilton and more money for dinner. 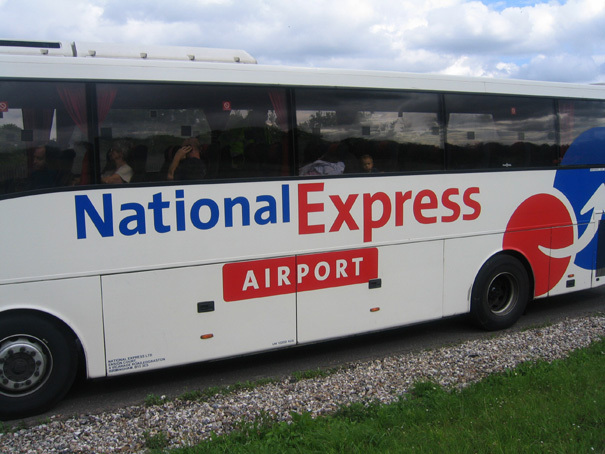 The National Express Airport has heard from me oh yes they have. This year Bettina said she had a project for me, a small black kitten had turned up a couple of weeks beforehand and no one could touch it or get near it. The family wanted to keep it but couldn't get it to trust them. So, I went to work. By the time we left the kitten was sleeping in bed with us, running up to everyone, eating indoors, playing and laying on his back purring between Mike and I and looking at us over his belly. Oh he is so sweet and full of love. Also as he became more socialized, Tiger the older cat decided he might be worth playing with. Bettina sent me a text when I got home from India saying that he was sitting on the verandah of our casita waiting for us to come back. OH. Sadmaking. I told her to give him, Blackie (the kids named him) lots of love and he would stop waiting for us and transfer his affection to them. I have the worst time finding a bikini that fits me properly and I've been looking for a good leopard bikini for ages. This year...success! Now, strange things happen sometimes in Ibiza. A couple of years ago, my friend Bonnie introduced me to her friend Rochelle in Houston. Rochelle went to Ibiza in the early '70s via a British mail van and most of Europe with her kids. She has a shop there on the beach at Cala D'hort overlooking Es Vedra (the sleeping dragon) and lives in Houston part of the year and Ibiza part of the year. The island of Es Vedra is one of the most magnetic places on earth. Very magical. So, we were supposed to go see Rochelle last year but two weeks gets shorter when you're living them and we never managed. This year I met her again at my jewelry party in Houston. As our vacation wound down we started talking about going to see Rochelle. There were just a few days left. We came home at dawn one morning after seeing Ferry Corsten and just slept and then lounged around the house. In the afternoon Mike needed to go to the internet cafe to do a few work things. At the very last minute I decided to go with him just to get out of the house. He let me off at the cafe because there was no parking in sight and it took ages for him to park and walk back. I went in, ordered a juice and a tostada and sat down at a computer. I sensed someone walking by me and looked up, it was Rochelle. Until that moment I wasn't sure I'd remember what she looked like. But when I saw her I knew instantly. She didn't recognize me at all until I said who I was. She had just come in to use the bathroom. She almost didn't. That's the kind of thing that happens when you travel. A few seconds either way in either of our schedules and we would never have seen each other. I'm so glad I did. It was even more chancy because she had only just arrived on Ibiza and was heading out again very quickly as she is caring for her mother who has alzheimers. We joined her that evening at Cala D'hort on the beach and then went back to her house in the hills overlooking Es Vedra and drank some wine and watched the sun set and the moon rise. Another friend of hers joined and it was very very pleasant. Es Vedra through Rochelle's Balinese window, strange match-up yes? That was pure accident. If there is such a thing.